Overall the graphics look less than impressive in the Crystal Gems Video Slot. However, this game does make up for it with its Wilds and two rewarding Bonus Features. Lucky players can receive multipliers of up to X5 their total bet. Those who have either a love for gemstones or bonus features should definitely take the Crystal Gems Slot for a spin. Diamonds are anyone’s best friend in this 25 Video Slot filled with precious jewels. 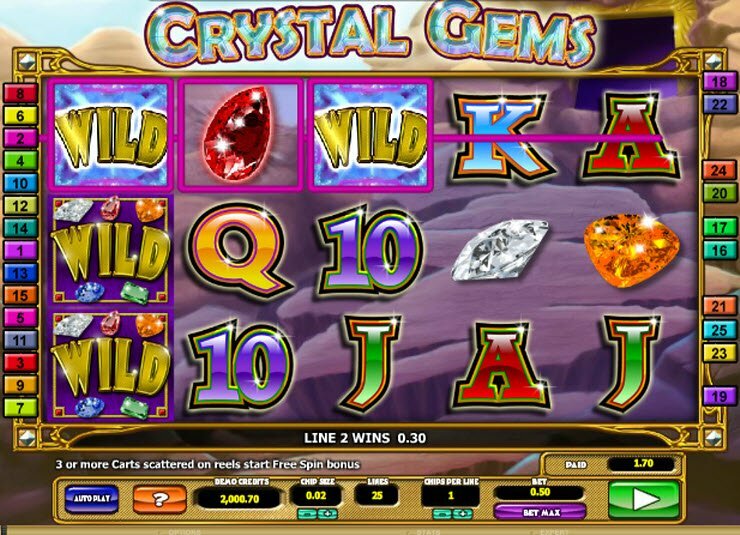 The Crystal Gems Slot comes from 2by2 Gaming via the Microgaming Quickfire software platform. The shining factor undoubtedly comes from the game’s Bonus Rounds. Lucky players who activate either the Free Spins Bonus Round or Crystal Mystery Bonus Round receive multipliers and free spins. The Crystal Gems Slot Machine has reels covered in sparkling precious gems. 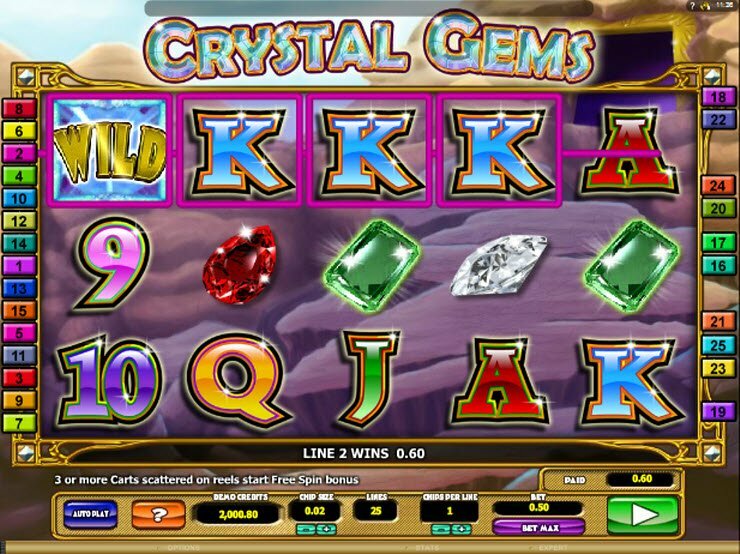 Although the jewels look real enough to touch, the overall graphic quality of this online slot falls short. The images of letters and numbers look too simplistic and the design pales in comparison to other video slots out there. That being said, the Crystal Gems Slot Game does have some redeeming qualities when during a winning combinations, the gems glisten and animate. Where the Crystal Gems Slot fails with graphics, the game makes up with its bonus features. Some might consider the graphics secondary to the bottom line of a slot machine – bonuses. Online gamblers come to play online slot machines to win cash payouts. So where the Crystal Gems Slot fails with graphics, the game makes up with its bonus features. First of all, the game contains a Wild symbol which substitutes for all symbols except the mine cart. Wild Symbols make it a lot easier to win payouts… and that’s always a good thing! In addition, the Crystal Gems Slot bonuses include contains two different bonus rounds. During the Free Spins Bonus Round, lucky players can win 2X, 3X, 4X, or 5X Multipliers for each payline. This bonus feature triggers when 3-5 Mine Cart symbols appear on the reels. In addition, the game can activate a Crystal Mystery Bonus which the game awards at random. 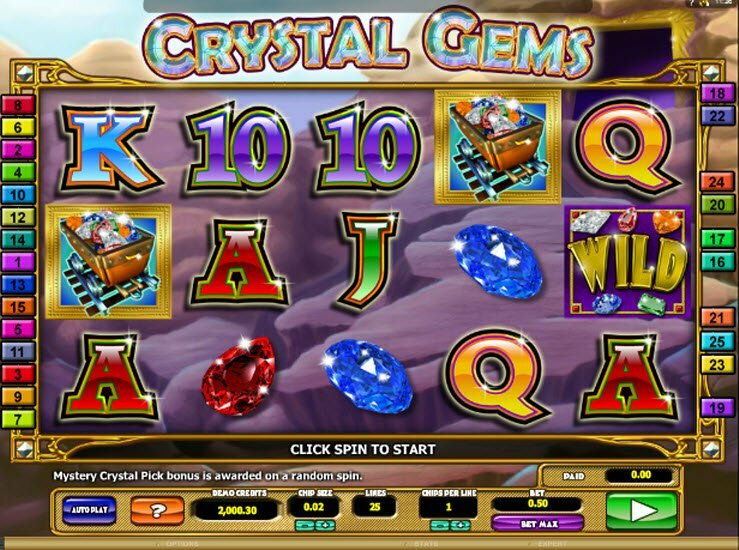 During this bonus feature, players choose among three crystals to win credits. The awarded credit then multiplies by the total wager.